The 2016 Virtual Convention is history. It wasn’t as well attended as I’d hoped, but I’m happy to have offered an alternative to those who couldn’t attend the IPMS Convention in Columbia. I started my dat at 9 a.m. and spent the better part of the morning putting the finishing touches on two models that came close to breaking me down, an Airfix 1/72 P-40B and Hobby Boss 1/72 Rafale. (More on those models in an upcoming article.) I had intended to finish them earlier in the week so I could spend the entire day on something new, but as I’m slowly (too slowly) learning in my middle-age years, everything seems to take longer than I anticipate. On of my recommendations to those of you who couldn’t attend the Nats was to pick up the phone and talk to a friend, so before I left for lunch I spoke with my friend David. He’s one of my oldest friends, and a conversation with him always reminds me of the enthusiasm we had for the hobby as teenagers. Then I was off for lunch, a quick roast beef sandwich at Roy Rogers. Back at home I finally started my next project, an Academy 1/72 F-16. I did some research on the kit over the last week and have been studying high-resolution photos of the team’s aircraft, so I’m ready to begin. I didn’t get very far, but I’m a slow modeler by nature, and I find that I need to take my time to avoid making mistakes. I spoke on the phone briefly with my friend Graham, who was also participating in the virtual convention. We share many of the same interests and approaches to the hobby, so it’s always a pleasure to get his take on what’s happening in the hobby. By 6 pm I was done for the day. My fiancee and I went to dinner and then to the movies to see Star Trek Beyond. 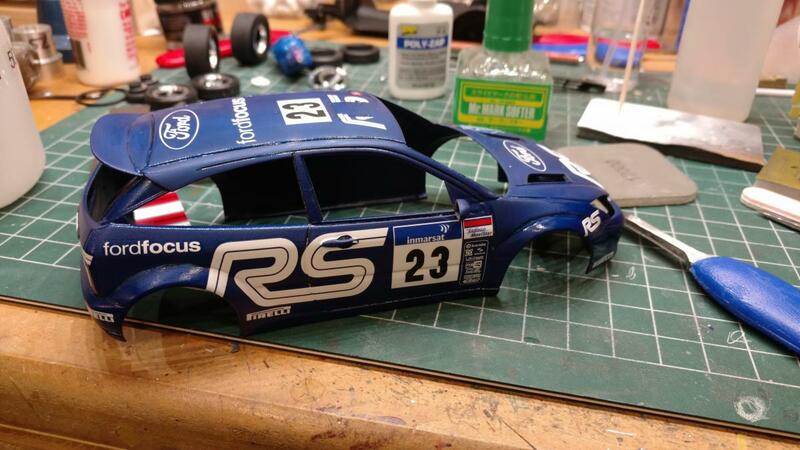 Here’s a glimpse into what other Scale Model Soup readers did…. My friend Graham spent time doing what all armor modelers hate, assembling track. At the very least it’s a task that can be done while watching television. He also primed a Whippet. Pedro Negron sent me photos of a couple of models he recently completed. The first is an impressive Takom 1/16 FT-17 Renault. He tells me the kit is mostly out-of-the-box, replacing only the gun barrels and springs. He painted it with Ammo colors and and pigments, as well as Tamiya and Windsor & Newton oils. You can see Pedro’s full build here. Pedro also sent me photos of his Tamiya 1/35 M4A3 105mm Sherman. After chopping the top and applying Red Bull promotional paint scheme to a ’53 Chevy, Peter Johnson spent time over the weekend applying additional coats of clear to the model and then sanding and polishing. Peter’s other project for the weekend was this Ford Focus. Peter tells us that he’s painted it five times (been there, done that!) after a series of mistakes and flawed application of either paint or decals. Peter, if you hire a priest for that exorcism, let me know; I may have an exorcism to perform in my workshop as well. Mark Deliduka was our most prolific participant. From our thread on the IPMS forum it appears he worked on at least a half dozen models, so I can only assume he was awake for 72 hours. 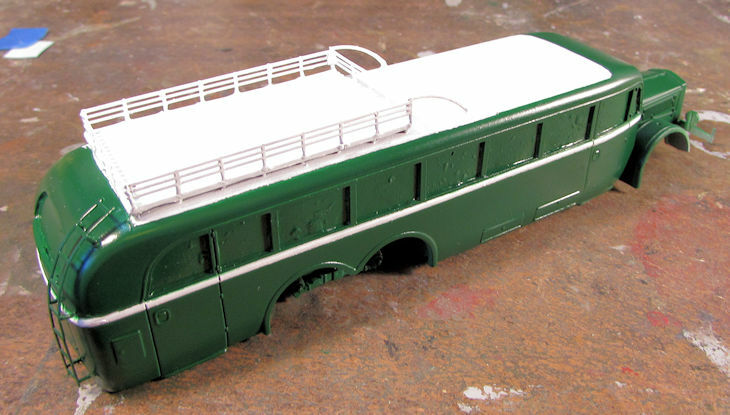 I’m impressed by the work that’s going into his B-377, and his Vomag 7 bus has a striking paint scheme. 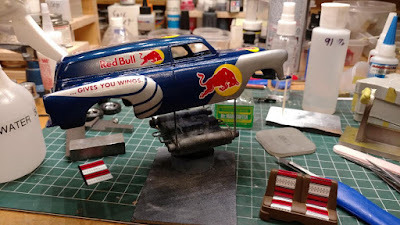 An early mentor of mine sent me photos of his recent build, an Airfix 1/72 Dominie that he purchases for just one dollar. Why so cheap? It was missing the engines. 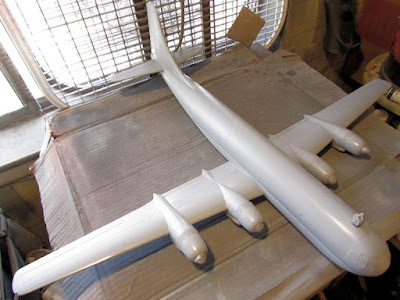 Always the industrialist, Joe cut down a couple of spare wing tanks and used them as replacements. I'm not surprised. This is the same man who scratchbuild a Spitfire wing using a deck of playing cards. All in all, it was great to allocate the entire day to the hobby, and that is the biggest lesson for me, which was echoed by Graham as well. We realized that we usually get only an hour or two here and there to work on models during our busy lives, so it’s rare to have a solid four, six, or eight hours at the workbench. Looking forward, maybe the virtual convention isn’t something that happens once a year. Maybe it’s something we’ll organize two or three times a year. It could be less of a virtual convention and more a virtual buildathon. We’ll have to give more thought to the idea and look to expand it beyond IPMS circles. My primary goal with Scale Model Soup has always been to stoke enthusiasm for the hobby, and I can’t think of a better way to do that than to get dozens or hundreds of modelers to spend an entire day building models together, even if virtually. My thanks to others who participated in this virtual convention.